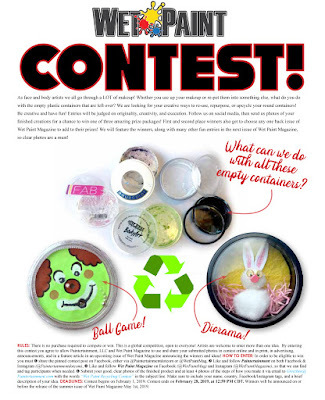 We at Paintertainment and Wet Paint Magazine are holding a contest this February! 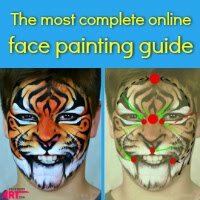 Unlike most face and body art contests, this one does NOT involve any painting at all! Rather, we are looking for your clever and creative ways to re-use and repurpose your empty paint containers! We've all got them lying around...containers that once held paint that we either used up or have re-potted into a new kit. Rather than tossing them in the trash or recycle bin, why not use our creative minds to come up with other fun ways to re-use them? 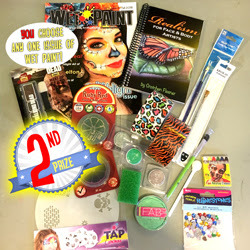 Paintertainment is sponsoring hundreds of dollars worth of prizes for the top three winners of this contest! 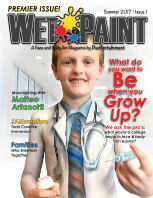 The first two places will also get to choose which issue of Wet Paint Magazine they'd like included in their prize pack. 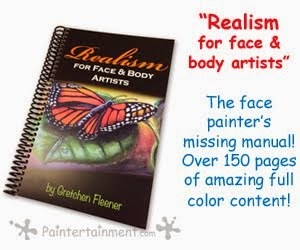 Every winner gets a copy of Gretchen Fleener's book "Realism for Face & Body Artists," and an awesome assortment of paints, brushes, stencils and other goodies! Who knows...we may throw in even more surprises before we ship these! There is no purchase required to compete or win. This is a global competition, open to everyone! Artists are welcome to enter more than one idea. 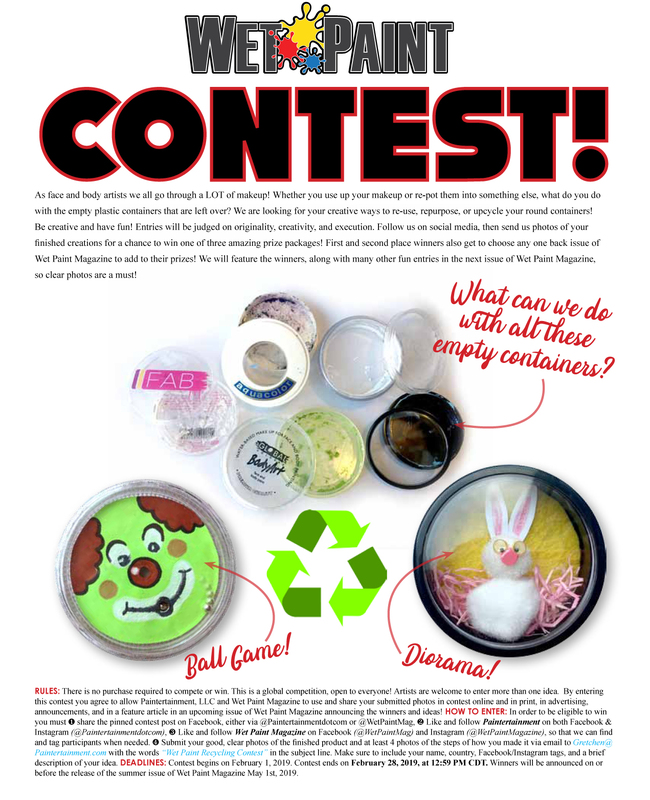 By entering this contest you agree to allow Paintertainment, LLC and Wet Paint Magazine to use and share your submitted photos in contest online and in print, in advertising, announcements, and in a feature article in an upcoming issue of Wet Paint Magazine announcing the winners and ideas! Contest begins on February 1, 2019. 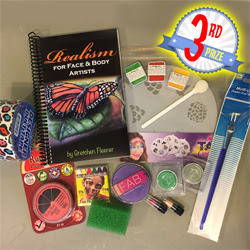 Contest ends on February 28, 2019, at 12:59 PM CDT. 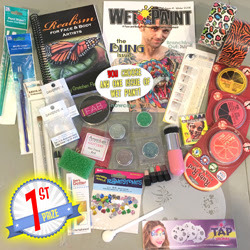 Winners will be announced on or before the release of the summer issue of Wet Paint Magazine May 1st, 2019. 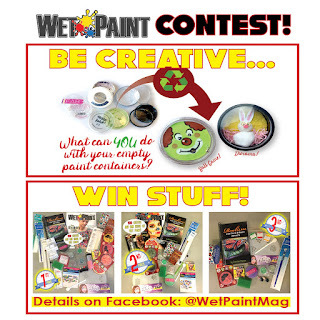 ❷Like and follow Wet Paint Magazine on Facebook (@WetPaintMag) and Instagram (@WetPaintMagazine), so that we can find and tag participants when needed. 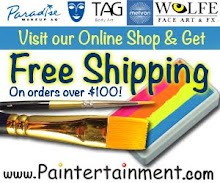 ❸Submit your good, clear photos of the finished product and at least 4 photos of the steps of how you made it via email to Gretchen@Paintertainment.com with the words “Wet Paint Recycling Contest” in the subject line, no later than February 28, 2019 (11:59 pm CDT). Make sure to include your name, country, Facebook/Instagram tags, and a brief description of your idea. We want to share your creations in the next issue of Wet Paint, so good, clear photos are a must! Questions? 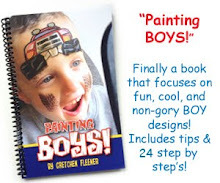 Email Gretchen[at]Paintertainment[dot]com! Good luck and have FUN! 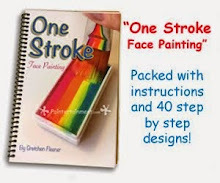 NEW One-Stroke Book Now Shipping! 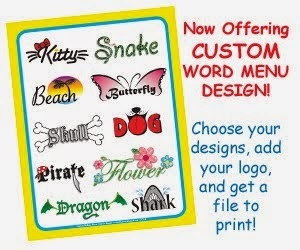 Build Your Own Word Menu! We lay it out and send you a file! New Year and New Creative Challenges! Check out my Thumbtack profile!